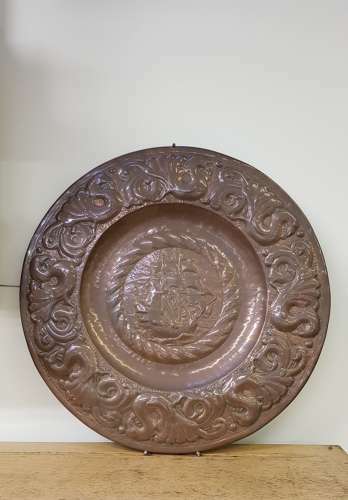 Superb and rare large Newlyn copper charger approx 20" diameter with typical galleon motif to centre and stylised sea birds around the outer edge. Very lightly incised to back Desd. by JD Mackenzie Worked by P Hodder, Newlyn. Circa 1899. John D Mackenzie was the instigator, innovator and master artist craftsman of the Newlyn School of Copperworkers. Indeed the school and copper industry flourished under his direction. Philip Hodder was Mackenzie`s right hand man in the early days and was also responsible for his work on the four plaques Earth, air, fire and water which grace the facade of the Newlyn Art Gallery.